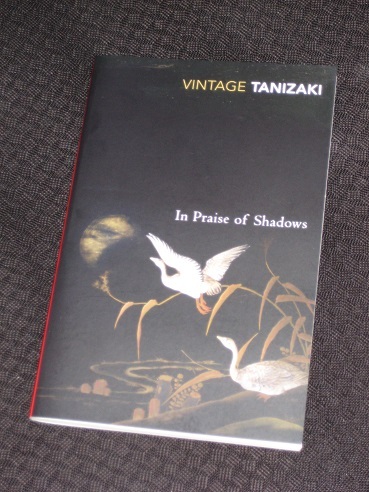 …which is pretty much Tanizaki’s point. For him, Japan is a land of shadows, and his native culture has developed with this in mind, in areas ranging from letter writing to pottery and architecture. The catalyst for the ideas (in this text, at least) is the writer’s realisation that while modern conveniences such as heaters and glass windows may make life more comfortable, they lack a certain something – the ability to blend in with traditional Japanese homes. Later in the essay we learn of the gloomy nature of traditional Japanese houses. Where western homes are designed to make full use of available light, those in Japan seem to want to keep it out, filtering it through a series of blinds and screens until it stops, well short of the centre of the building. But in the still dimmer light of the candlestand, as I gazed at the trays and bowls standing in the shadows cast by that flickering point of flame, I discovered in the gloss of this lacquerware a depth and richness like that of a still, dark pond, a beauty I had not before seen. It had not been mere chance, I realized, that our ancestors, having discovered lacquer, had conceived such a fondness for objects finished in it. He also discusses the way in which household items can even become more beautiful with age in these dark environments, explaining how the patina of time can enhance the appearance of objects (thanks to what he calls ‘the glow of grime’). In the west, he claims, we would prefer to eradicate the dirt rather than embrace it (which sounds right to me!). In truth, there’s little need to make excuses for what is less an academic tract than a series of highly personal reflections, patched together by a writer skilled in combining thought-provoking ideas with everyday common sense and humour. While it may appear to lack a guiding thread at times, the essay usually makes its point and guides the reader skilfully to its conclusion. No, despite the advantages of white ceramic bowls and gleaming floor tiles (not to mention the comfort of being indoors…), Tanizaki is not a fan of western toilets. I first read this book during my first year at uni (it was required reading for my architecture course), and fell in love with his style. I revisit this book every once in a while, I feel that it exudes a certain calmness and descriptiveness that is almost seductive. Love your comments on this. Makes me want to revisit the book again. Michelle – Well, I read it three times in a month before reviewing it, so I can understand your wanting to have another look 😉 Oh, and nice to see you around again (I think it’s been years since your blog, no?). Oh, I’ve been around, just really less active than I used to be. But it feels great to poke around blogosphere every once in a while. Max – Absolutely (a bit of toilet humour is always welcome! ).